Michael Weyman scored two tries as Hull KR earned a convincing Super League win at Warrington. Weyman grabbed the only try of the first half, before Travis Burns and Kris Keating put the visitors 18-0 up by the hour mark. The Wire then hit back through two converted Richie Myler efforts either side of Burns' drop goal for Rovers. Wolves had a Rhys Evans try disallowed before Weyman secured Rovers' third successive win with his second score. The Robins avenged their Challenge Cup defeat by the Wolves five days earlier, condemning Tony Smith's side to a third home loss of the season. It took until four minutes before half-time for the deadlock to be broken by prop Weyman, who collected a pass from Burns to go over after the half-back had barged past Trent Waterhouse. Burns added a second score five minutes after the restart, pouncing after Keating's kick had rebounded off Myler, before Burns turned provider for his half-back partner Keating on 58 minutes. Four minutes later, Myler responded after good work from Chris Bridge, only for Burns' one-pointer to narrowly stretch Rovers' advantage. Josh Hodgson then set up Weyman for his second, before Myler rounded off the scoring with his second try of the game, but it was not enough to deny the visitors. 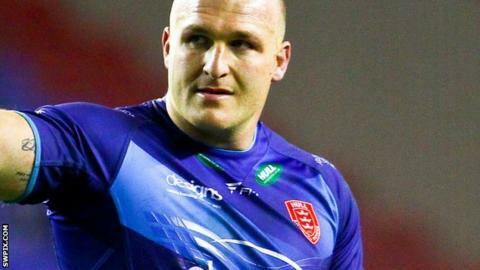 And Warrington's night got worse when, after the game, it was confirmed that prop Paul Wood (torn bicep) and Simon Grix (dislocated shoulder) suffered injuries in the defeat. "Both players [Grix and Wood] face operations and it's devastating after they have worked so hard. "We lost a bit of punch from our attack from last week but weren't far off. "It was a good even contest in the first half but we needed to take our chances. In the second half we didn't build a game or show patience. "I couldn't fault our effort but we needed to be a bit more smart." "Travis [Burns] was outstanding but it was a really good performance by all the boys. "To come away with two points against a quality team like Warrington is very pleasing. "It's another step in the right direction and it was an improvement on last week." Warrington Wolves: Russell; R Evans, Bridge, Atkins, J Monaghan; Ratchford, Myler; Hill, M Monaghan, Wood, Waterhouse, Laithwaite, Grix. Replacements: Harrison, Currie, England, Dwyer. Hull KR: Cockayne; Gardner, Welham, Salter, Caro; Burns, Keating; A. Walker, J. Hodgson, Weyman, Larroyer, Horne, Costigan. Replacements: Hall, Green, Netherton, Lovegrove.